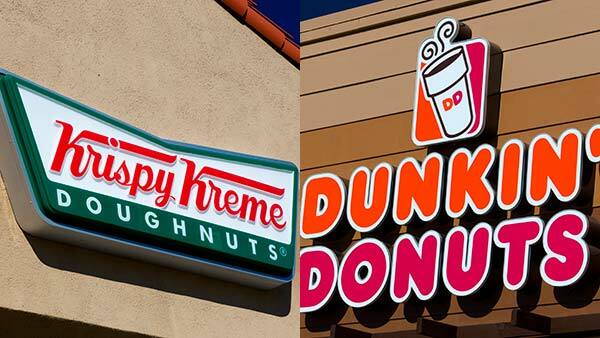 Could a doughnut deal between two of the biggest players in the industry be in the works? According to Bloomberg, rumors are swirling that JAB Holding Co., the owner of Krispy Kreme Doughnuts, is looking to buy Dunkin' Donuts. In a statement Thursday morning, Dunkin' Brands Group Inc. said, "as a public company, it is our policy not to comment on rumors or speculation." The still unconfirmed talks sent the Massachusetts-based Dunkin' stock to rise 8 percent on Monday. According to Bloomberg, the transaction value would be approximately $8.2 billion. Other investments of the Luxembourg-based JAB Holding Co. include Panera Bread, Keurig Green Mountain, Einstein Bros Bagels, and Peet's Coffee. For doughnut - or donut - enthusiasts, this is something to chew on. Click here for more stories and videos about Krispy Kreme.